Do we really need snow? Ann cleans up my act. 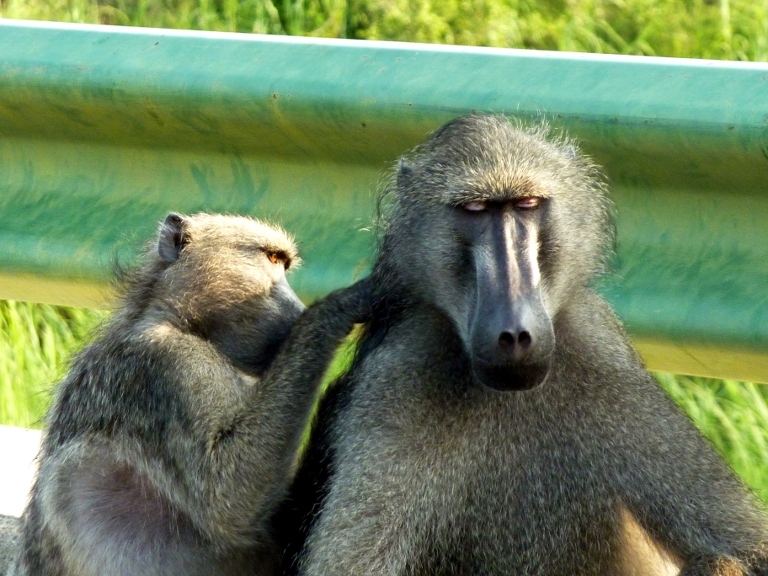 We begrudgingly left Kruger National Park for it was a great time. We would wake up at 4:30 in the morning so we could be at the camp gate opening at 5:30. We would come back to the camp for an early afternoon breakfast then go back out for more game sightings until the gate closing at 6:00. We thought the gate closing was too early because the animals just were starting to get active after hiding from the day’s sun. We were the only guests at the White River retreat just outside the park. This was a stopover on the way to Port Elizabeth for we spent all morning in KNP spotting a leopard. On the way were many Africans walking on the road. Mini buses were everywhere stopping for people and darting back into the traffic. As in Thailand on 2 lane roads, if you are driving slowly you are expected to ride on the road shoulder so the middle of the road can become available for passing. You have to also watch for this on oncoming traffic. This is new driving skill that has to be acquired in South Africa. 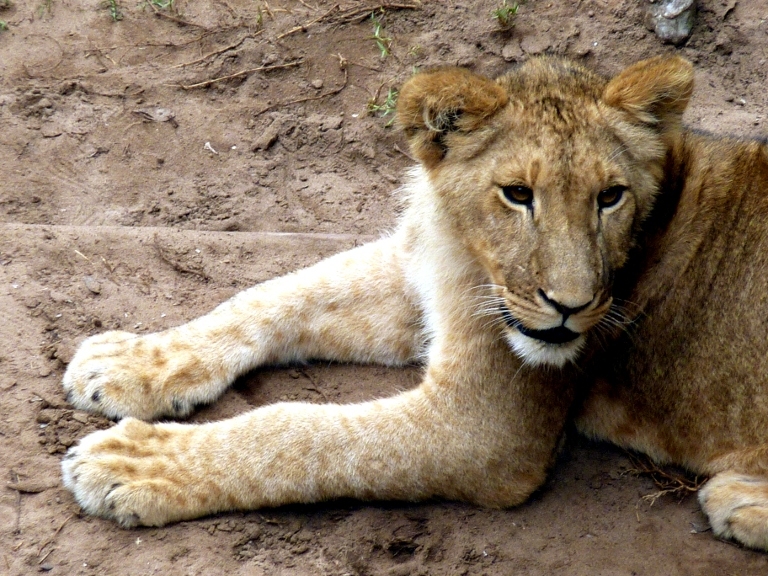 This lion is 3 months old. 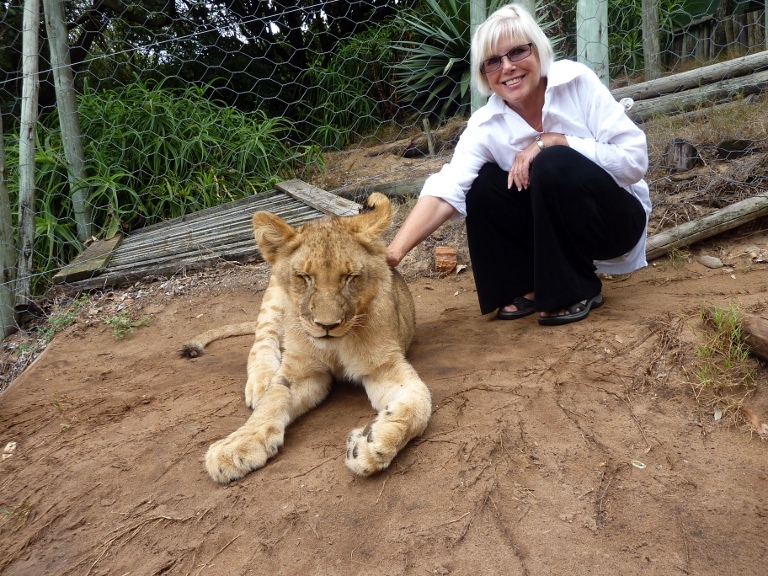 Ann the African Lion queen. 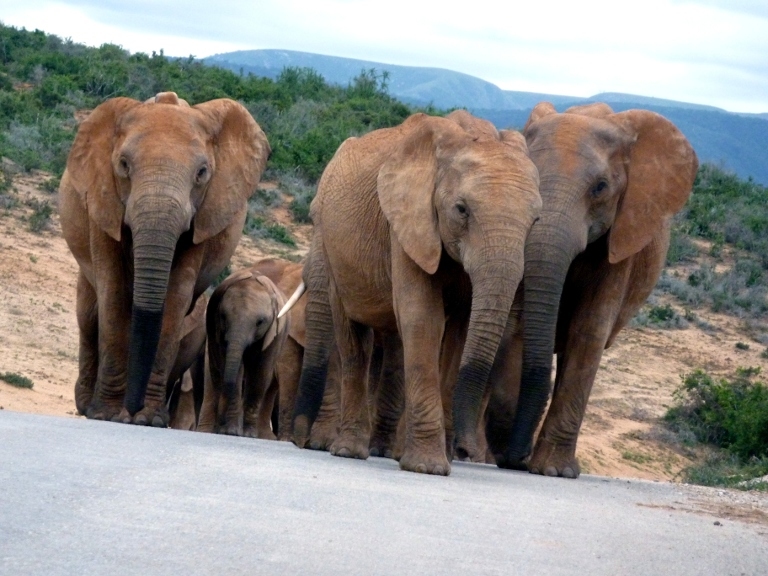 After the week in PE we ventured to ADDO Elephant Park, South Africa’s third biggest park, for a three day stay for more game sightings. 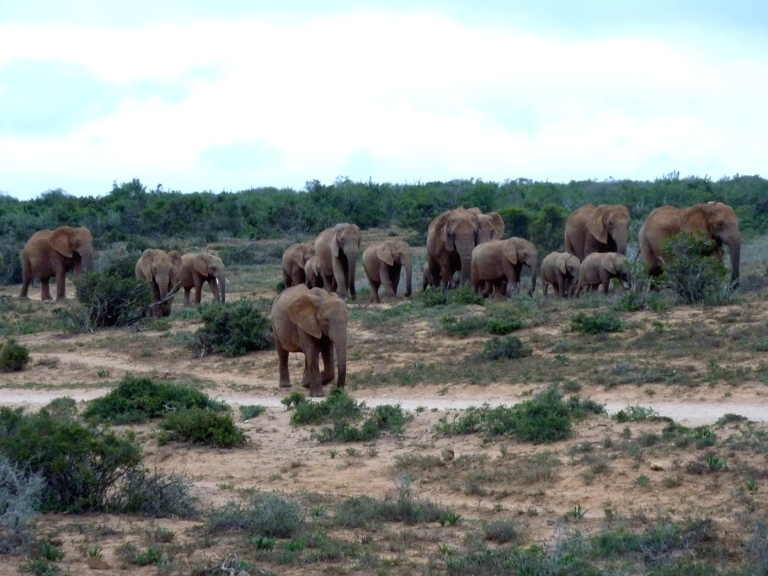 The high points of the stay were a herd of elephants running to a water hole, a lion strolling to another water hole that we were sitting at all morning, and a herd of elephants heading to a water hole. Elephants heading to the water hole. We just pulled into the water hole and maneuvered our car for a good viewing. People in the two other cars parked there continued to look at us after we had settled for the wait. We wondered what was so peculiar about us to attract both car’s attention. After about 10 minutes of this staring we heard some noises from behind us. 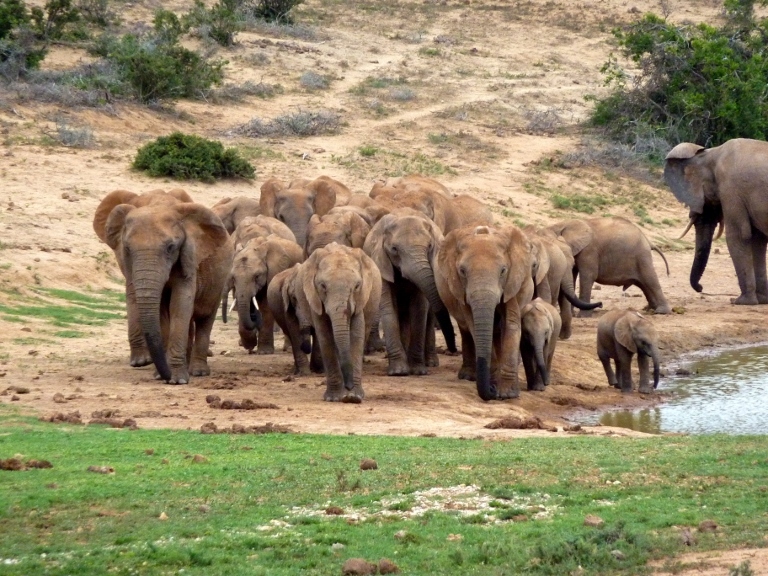 Everyone was not staring at us but over us because a herd of elephants was eagerly heading to the waterhole and we were between them and the waterhole. Ann started the car, stomped the gas, and drove the car to high ground all in one swift movement. 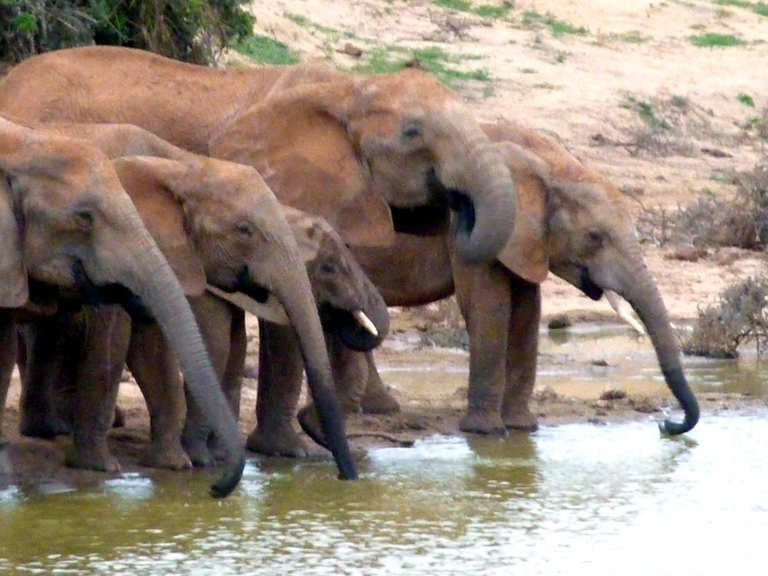 Elephants finish drinking then huddle to decide next move. They decide to move toward us. We are on their path. 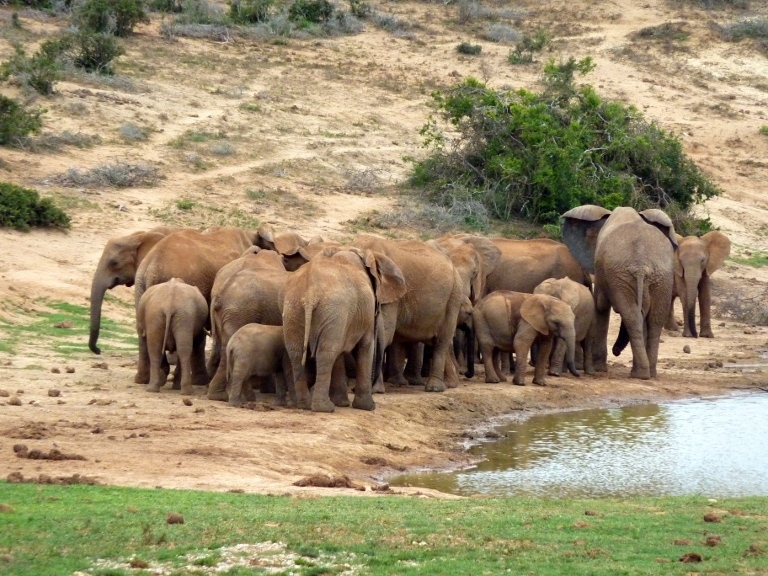 We watched the elephants enjoy the waterhole and as we noticed with most herds of animals they will huddle before making their next group move. 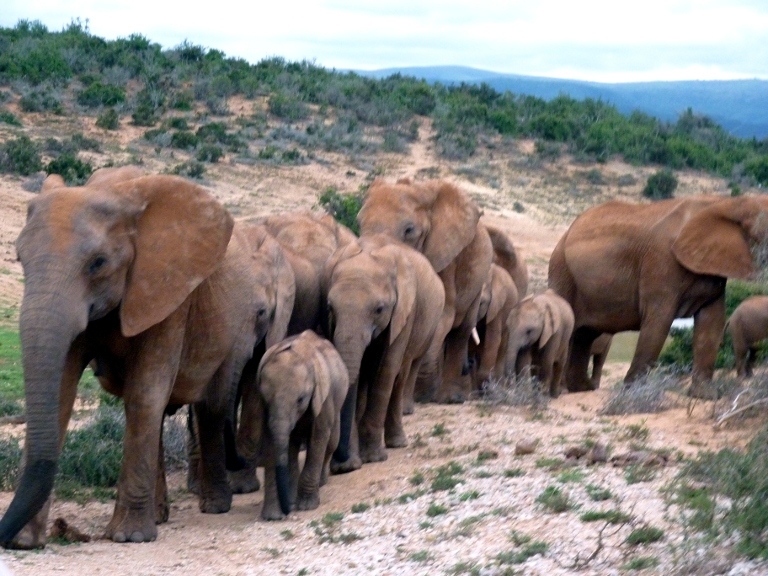 The huddle broke and the elephants again headed in our direction for we were on a old elephant path. The elephants being led by some big females stopped halfway between us and the hole and looked befuddled with their swaying back and forth. We could see the alpha bull coming up from the rear and the herd started moving forward again which we did also. Here they come! Why are they following us? We moved at the same speed forward as the herd and they seemed satisfied with this movement. 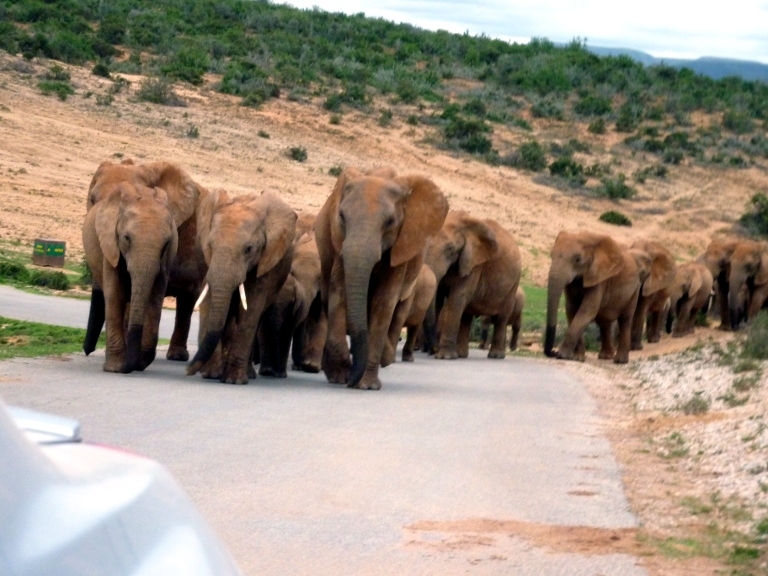 After some time we had passed the point were the path crossed the road and the herd then passed us only a few feet from our car. It was a highly exhilarating time where we both let out a big exhale after the herd passed. I think we will move on. The trip from PE to Cape Town is along what is called the Garden Route. On one side of route N2 is mountains and the other is the seashore. There are many activities and great places to stay. A short way from PE we stayed at a bed and breakfast at Paradise Beach, just south of Jeffrey Bay called the Moya Manzi. This place was just stunning. I have not and probably never will be in as beautiful a place or see a more beautiful ocean beach scene that can be seen from every room in the B & B. This opinion is probably compromised by how much I like the ocean and contemporary home styling. Between Paradise beach and our next stay at the town of Plettenberg is the National Park of Tsitsikamma, where all your outdoor wilderness adrenaline rushes can be met with suspension bridges, cliff climbing, rope sliding between cliffs, ocean raft rides, ocean kayaking, and the highest bridge bungee jump in the world. We hiked to the suspension bridge for our rush. We stayed 2 nights in a suburban B & B home and visited two tourist attractions of Monkeyland and the Birds of Eden. Monkeyland is a sanctuary for abandoned monkeys. Besides seeing and learning about nine different monkey species, Ann made her first rope suspension bridge crossing. You can be assured that she made the crossing because the alternative of going back to the gate alone without the protection of a guide with wild monkeys running around was less attractive. She made a different decision at the Birds of Eden because going back to the gate was not so bad because there was only an occasional kamikaze diving bird. The Birds of Eden was a huge outdoor aviary with a large maze of a boardwalks that weaved though a forest. The birds were more relaxing to view than the monkeys and you could walk at your own pace. The next stop was 2 nights in the town of Wilderness, which was where we had a hillside room at the Boardwalk Lodge. The receptionist described the town as a few shops owned by hippies. Imagine hippies in South Africa. All the rooms, offices, and dining area were connected by a series of stairways and patios on the hillside making it a unique setting. The mountain that the lodge was on, abutted the shoreline that provided a great view of the beach, that had about 10 people on it the busiest day we were there. Somehow way up on the mountainside we were still able to smell the ocean air, and maybe it was mixed with the air from the town, but we had a good feeling of euphoria on that hillside. We were halfway to Cape Town and we were feeling good about South Africa. Thanks Angie. You and Lou should get the camera and visit us in Paris. There are no more ashes in the sky now. George you may be interested in doing this when you get to France. Sherwin So just started a tennis blog. The French Open is a mere month and a half from now. Are you going to the French Open this year? If so, would like to keep a daily log of your experience and post it on the Tennis Blog? Contact me at sherwinstennisblog@gmail.com and we’ll post it. Let us know of the venue, the people at the tournament, any matches your were able to watch, player interaction, how the food at the site is or off-site, etc… Share your experience with the rest of us. Hi George & Ann. It was great to meet you at the Riad Saba in Marrakech – great blog too. We will be keeping up with you for the rest of the tour and will send some suggestions for your visit to the UK. You may be interested to know that the photos under this section are not visible (ie. broken links). Happy Travels – Dave, Niqui & Emily. George — didn’t realize that you were in Morocco already (time flies when you are voyeuristically following someone else’s adventures). Your elephant experiences sounded fantastic. I have been fairly close to elephants in zoos, etc., but to have a herd of something that big coming right at you must have been something! Waiting with anticipation for pictures of you and Ann having tea on camels. Thanks Dave, it stills has a few kinks in it. There is not too much time when travelling to do computer stuff. We can not wait to see you in London. Vera: I love you. Maybe you can be my teacher some day. I hope you have a good time on your trip. Andrei: I did a good job on my New York State tests. The tests were hard. Vera & I like looking at your pictures. Do you like Stars Wars?